This newly released Hubble image shows a pair of interacting galaxies known as NGC 3921. It is known today that merging galaxies play a large role in the evolution of galaxies and the formation of elliptical galaxies in particular. However there are only a few merging systems close enough to be observed in depth. 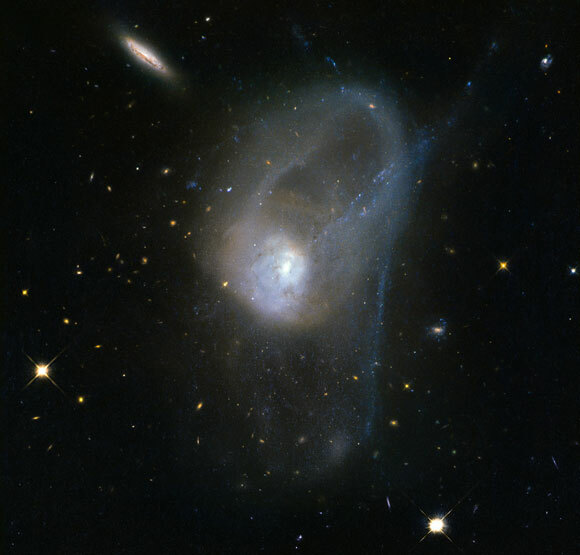 The pair of interacting galaxies picture seen here — known as NGC 3921 — is one of these systems. NGC 3921 — found in the constellation of Ursa Major (The Great Bear) — is an interacting pair of disc galaxies in the late stages of its merger. Observations show that both of the galaxies involved were about the same mass and collided about 700 million years ago. You can see clearly in this image the disturbed morphology, tails and loops characteristic of a post-merger. The clash of galaxies caused a rush of star formation and previous Hubble observations showed over 1000 bright, young star clusters bursting to life at the heart of the galaxy pair. 1 Comment on "Hubble Image of the Week – Evolution in Slow Motion"
are incomprehensible. For starters, the cosmos is expanding and there are more systems and not fewer. Where would the ‘Big Bang’ be if no systems formed afterward? Next, you are avoiding the objective possibility that this system is a fission in progress. Like so many others, there is ample evidence that the objects in the system share many ‘DNA’ traits like chemistry and morphology. What are the odds that two RANDOM objects would share so many traits?